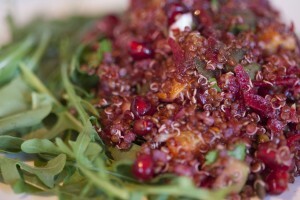 We could have called this Quinoa and Pomegranate Salad a superfood salad but we don’t like to follow the pack. It is, though. It’s food, it’s salad and it is straight-up super, packed full of ingredients that nutritionists wax lyrical about because they are so unbelievably good for you. Let’s call it a really, really great salad just be annoyingly different. Quinoa, the heart of the salad, is one of the few complete plant-based proteins, so this is a great dish for vegetarians and vegans, particularly for recovery. The oranges and the lovely pinky-purple flesh in pomegranates – called arils if you didn’t know – are both packed with anti-oxidants, fibre and Vitamin C, making this dish more or less health on a plate. You can swap and change the other ingredients – add celery, radish and nuts or other toasted seeds maybe. It’s all up for grabs once you have the key ingredients in your salad bowl. This is a sweet-ish salad, with cocoa in the dressing, which gives it a lovely tart taste. It’s great as a side dish or with crisp green salad leaves and avocado for a hearty main. Crumble on some sharp goats cheese for a vegetarian version or eat as it is to keep it vegan. Serve with crusty bread too, if you fancy. No need to follow the pack either – you decide. I used red quinoa because that’s what I had in the cupboard but white or black would work just as well. I also used some delicious Cocoa Balsamic vinegar from Hotel Chocolat (which adds a brilliant twist to dressings and other culinary creations; definitely worth treating yourself to). If you don’t have any of that, though, regular balsamic will do the trick. To make the salad, zest the orange then peel it and cut the flesh into 1cm chunks. Place the zest and orange flesh in a large bowl and add all of the other ingredients except the pumpkin seeds. Toast the pumpkin seeds in a dry pan for a 3-4 minutes and add to the rest of the ingredients. Mix well. To make the dressing, place all of the ingredients in a jar and shake well. « To Tri and Fail, or not Tri at All?